It’s easy to get into debt. Why? Banks want you to take out debt. The problem is car loans, mortgages, personal loans and credit cards all let you spend more than you earn. Banks love earning interest on the debt you owe them. Unfortunately, many people dig themselves deeper into debt than they realize thanks to a common misunderstanding. Despite what banks would have you believe, your salary and your net pay aren’t the same thing. Your salary is the amount of money you earn per year before any deductions are taken out. Your net pay is the amount of money you get each paycheck after all of your deductions are taken out. 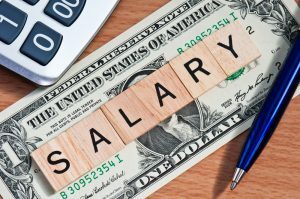 Unfortunately, there are usually quite a few deductions between salary and net pay. That means there is usually a large difference between what you think you have available to spend each year and the actual amount you have available to spend each year. While most people do understand their net pay will be lower than their gross pay, they often underestimate just how much lower their net pay is versus their gross pay. Banks take advantage of the fact many people don’t realize there could be a large difference between your gross annual salary and your net pay. For instance, you’ve probably heard of the 28/36 rule if you’re considering applying for a mortgage. The rule states you should spend no more than 28 percent of your gross income on housing expenses and no more than 36 percent of your gross income on all of your debt. Another common example is the 20/4/10 rule for auto loans. The rule states you should put 20 percent down on a loan that is no longer than four years and spend no more than 10 percent of your gross income on the car payments. Both of these focus on your gross income, not your net pay or net income. If you fall into this trap, you could be in for a nasty realization. A dive into the difference between gross annual salary and net pay will probably open your eyes. Usually, there are quite a few deductions fighting for your salary dollars. Some are mandated by the government, while others are voluntary. Unfortunately, these deductions are rarely the same for everyone. Thankfully, there are tools you can use to get a rough estimate of how much each will deduct from your paycheck. There are quite a few mandated deductions that will come out of your paycheck, but they vary by person. For instance, almost everyone has federal income tax withheld from their paychecks. States that have an income tax will likely require state income tax to be withheld. Surprisingly, some localities even have income taxes that are withheld, too. These taxes will be withheld based on your salary and the information you input on the Form W-4 or equivalent state or local form you most recently filled out. Similarly, almost everyone pays Social Security and Medicare taxes, commonly combined as FICA. Thankfully, this deduction is fairly easy to calculate for everyone. Social Security is withheld at a rate of 6.2% of your gross income after deducting things like health insurance premiums, dental insurance premiums, vision insurance premiums and pretax 401k contributions. Medicare is calculated the same way, but at a 1.45% rate. Combined, these could be listed as FICA at a 7.65% rate. In 2017, if you earn more than $127,200, you no longer have to pay Social Security tax for any earnings over $127,200, but you do have to pay the Medicare tax. That means your paychecks at the end of the year after you reach the $127,200 limit will be a bit higher than your paychecks from earlier in the year. The limit changes every year. If this affects you, make sure to look up the updated limit at the beginning of each year. Taxes aren’t the only mandated deductions that disappear from your paycheck. In some cases, a court order may mandate that items such as child support, alimony or restitution be withheld from your paycheck. Not all deductions from your paycheck are mandatory. In fact, there are quite a few voluntary deductions that you’ll likely see on your paycheck. The most common of these are employee benefits like health insurance, dental insurance, vision insurance, life insurance, short term and long term disability insurance and retirement plan contributions. 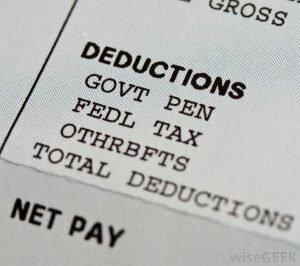 The amount of each of these deductions will vary depending on your employer’s programs. Depending on what you choose, they can take a hefty portion of your gross pay. Between mandated deductions and voluntary deductions, it is easy to see how your annual net pay could end up being much less than your salary. Here are a couple examples to drive the point home. In both of these examples, we assume the individual is single with no children. They have health insurance premiums of $75 per paycheck, dental insurance premiums of $10 per paycheck and vision insurance premiums of $5 per paycheck. They also contribute 10% of their salary to a 401(k). For simplicity’s sake, we didn’t account for any state or local income taxes and used 1 federal allowance on form W-4. However, we’ve provided the impact of what 4% state income tax and 1% local income tax on gross income would have. If you’re spending based on your gross pay, you’d be spending over $18,000 more than you earn in the $50,000 example. You’d spend over $40,000 more than you earn in the $100,000 example. If you want to calculate the results of a hypothetical paycheck like we did, you can use this salary calculator at PaycheckCity.com. While 28 percent of your gross income doesn’t sound too bad for housing payments, when you calculate how much of your net pay that would be, it is a bit disturbing. In the $50,000 salary example, 28 percent of gross income would be $14,000 per year. That’s almost 44 percent of your net pay. The 36 percent of gross income, or $18,000, on all debt payments is even crazier. That would be just over 56 percent of your total income, only leaving 44 percent of your income for everything else. The 10 percent of gross income you’re allowed to spend on your auto loan would be $5,000 per year or almost 16 percent of your net pay. If you did go with the 36 percent of gross income for all debt, you’d only have $13,916 for all of your other expenses. You’d have to pay for auto insurance, fuel, all of your utility bills, your groceries, dining out, clothing, entertainment, hobbies, education, gifts, healthcare, household supplies, pet expenses, vacations and any other expense you can think of with just $1,160 per month. Running the numbers of the $100,000 salary example is just as disturbing. Your $28,000 housing costs would be almost 47 percent of your net income and the $36,000 in total debt payments would be just over 60 percent of your net pay leaving just 40 percent of your net pay for all other expenses. That would be $23,888 per year or $1,991 per month. While these numbers are higher than the $50,000 salary example, chances are you’d be spending more money, too. The percentage of disposable income would be lower than the $50,000 example. The $10,000 in allowable auto loan costs would be almost 17 percent of your net pay. Gross pay is a real number. It just isn’t a number you should be using to make financial decisions in regards to debt payments or how much money you can spend every month. If you fall into this trap, you’ll quickly start incurring more debt than you can manage. Rather than focus on gross income, take a good look at each paycheck to see your net pay numbers. Base your expenses and debt payments off of these numbers, not what others say you can afford. There’s nothing wrong with spending only 10 percent of your net pay on housing or buying a car in cash so none of your net pay goes toward a car loan. Banks won’t be a fan because they won’t be earning interest from you, but you shouldn’t aim to please banks. You should aim to set yourself up to be financially successful. It’s important to understand how your money works. Learning how to make decisions based on net pay rather than gross pay is a great step in the right direction. If you’ve dug yourself into a decent amount of debt, it’s nothing to be ashamed of. Start working to correct the errors you’ve made in past. Start spending less than your net pay. If you have a large car loan you can’t afford, sell the car and buy a cheaper car. It may not be fun, but your finances will be in much better shape. Read how My Wife and I Paid Off 80k of Student Debt in 3 Years.